At Bonita Bay Club, it’s about choices. Whether you’re craving upscale dining, a healthy meal or casual fare, your ideal meal is just steps away. We offer venues and menus that will have your taste buds applauding. Bonita Bay’s culinary excellence is masterminded by our award-winning Director of Culinary Operations, Chef Richard Brumm, CEC, CCA. Chef Brumm embraces the scratch kitchen concept, balancing tradition with adventure. His diverse menus are informed by his philosophy of comfortable, approachable food using the freshest, wholesome ingredients and classic cooking techniques. Attentive staff anticipates members’ needs with superior service that continually earns excellent member satisfaction ratings. Our newest and most exciting dining concept yet, the Breezeway Bar & Café is the fan favorite at our new Sports Center. Serving up perfectly blended frozen cocktails and an array of paninis, fresh seafood baskets and delicious salads, our ultra-casual, open air restaurant is a winning option for post-match and poolside dining. The WAVE Café at the Lifestyle Center offers fresh, organic produce for made-to-order juices and smoothies. Choose a base of artisan greens, multigrain bread, quinoa, brown rice or a gourmet wrap, and pick your protein for your healthy on-the-go lunch. With indoor seating overlooking serene golf landscapes and alfresco dining under the pergola, the Clubroom offers an extensive daily lunch buffet along with a full a la carte menu. Sunday buffets and seasonal holiday menus are truly memorable. 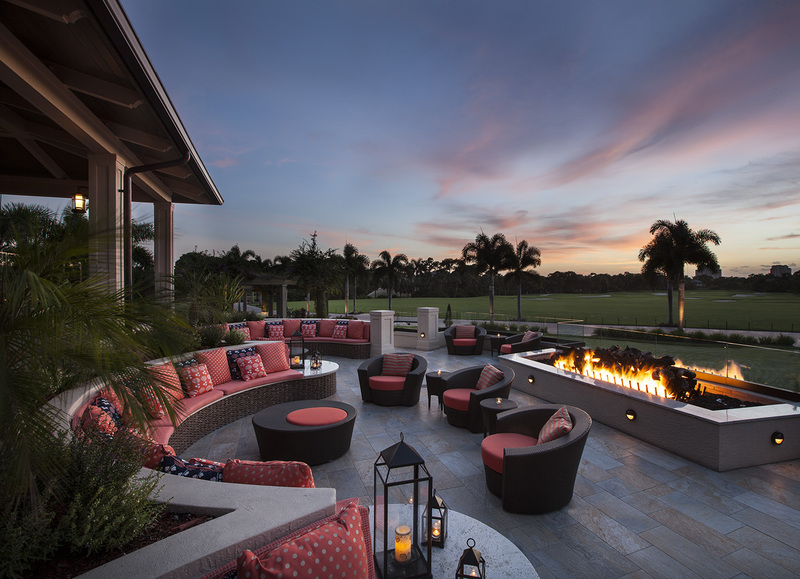 When it feels like a bluejeans kind of day, the casual 55th Hole welcomes you to savor the sunset at the firepit or catch the conference finals on one of its eight television screens. Our casual and modern pub fare includes a delectable assortment of flatbreads, burgers, sandwiches and salads. In the Fireside Room, gourmands and oenophiles alike are delighted by memorable gastronomic experiences and special events featuring exclusive winemakers and visiting chefs. Daily indoor and patio dining complements to the serene Audubon Cooperative Sanctuary and “pure golf” experience at Bonita Bay Club Naples. At Bonita Bay Club, weddings, anniversaries and holidays are among treasured memories for your family and friends. From everyday dining to life’s most special celebrations at Bonita Bay Club … it’s where you belong.